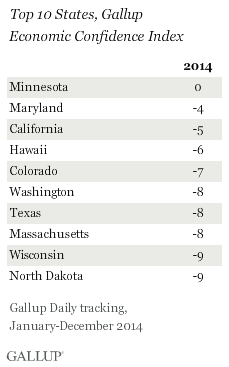 WASHINGTON, D.C. -- Gallup's Economic Confidence Index scores in 2014 were highest in Minnesota -- the only state with a non-negative score -- followed by Maryland, California and Hawaii. 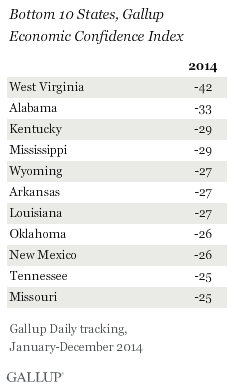 Scores were lowest in West Virginia, Alabama, Kentucky and Mississippi. These results are based on Gallup Daily tracking interviews with 176,702 national adults conducted from January through December 2014, and represent averages for the year. 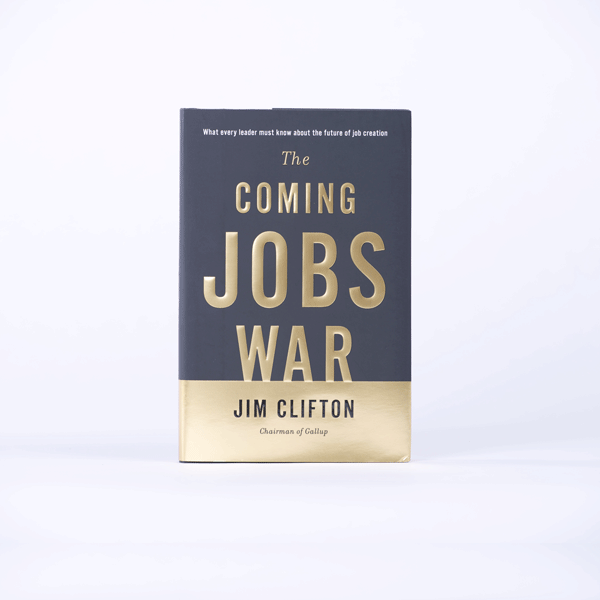 Gallup conducted interviews with at least 450 residents in every state and interviewed 1,000 or more in 41 states. The Gallup Economic Confidence Index is a composite of Americans' ratings of current U.S. economic conditions and their perceptions of the economy's direction. The index has a theoretical maximum of +100 (if all respondents rate the economy "excellent" or "good" and say it is getting better) and a theoretical minimum of -100 (if all rate the economy "poor" and say it is getting worse). Nationally, the index averaged -15 for all of 2014. However, scores improved dramatically in the last part of the year, and have consistently been in positive territory so far this year. The ratings reported here, based on averages for all of 2014, do not necessarily reflect current confidence. However, given that there is a decent level of consistency in state rankings from year to year, the relative state rankings may still generally hold even if Americans overall, and in each of the 50 states, are currently more upbeat about the economy. 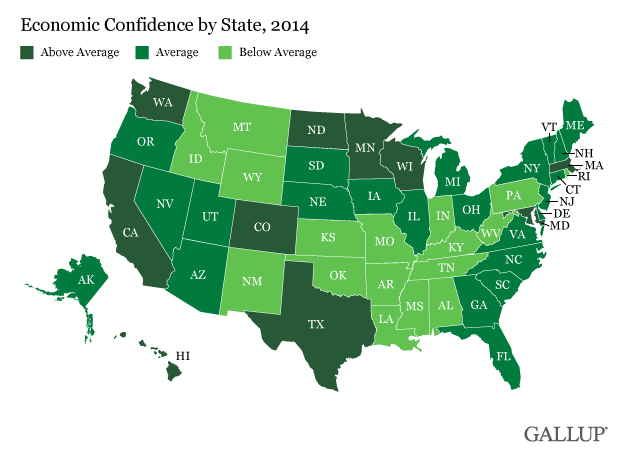 Gallup has tracked economic confidence ratings at the state level since 2008, and prior to Minnesota's latest rating of zero, no state has had a non-negative annual score. The District of Columbia, which had a score of +18 in 2014, has had positive scores since 2012 and has maintained a significant lead in confidence over residents in the 50 states since 2009. Though most of the states with the highest index scores are the same as in 2013, Hawaii (-6) and Colorado (-7) moved upward in 2014 after not having made the top of the previous year's list. Washington, Texas and Massachusetts, each with a score of -8, remained in the top 10 from the prior rankings. Wisconsin and North Dakota, both scoring -9, also returned to the top of the list. Scores in Iowa (-11) and Nebraska (-11) -- both of which have regularly been atop the list in recent years -- as well as Connecticut (-14) each dipped slightly, and therefore, these states lost their spots among the top 10. Of the states where residents are least confident about the economy, West Virginia (-42) remains at the bottom -- a distinction it holds for the fifth year in a row. Alabama (-33) had also found itself among the bottom states in recent years, but its nine-point drop in 2014 sent it to the second-to-last spot after West Virginia. Like the upper tier of the list, the bottom tier in 2014 has many repeats from the previous year. Kentucky (-29), Louisiana (-27), Arkansas (-27), Wyoming (-27), Oklahoma (-26) and Tennessee (-25) all remain among the states where residents express the least confidence in the nation's economy. New additions to the list include Mississippi (-29), New Mexico (-26) and Missouri (-25) -- each of which slipped several points in confidence in 2014. Gallup has found in the past that there is a political nature to economic confidence, as states where residents have higher confidence tend to be more approving of President Barack Obama, while those with lower confidence are least likely to approve of him. Presidential approval, however, isn't always an accurate barometer of economic confidence. North Dakotans, for example, are among the least approving of Obama but have far greater confidence than residents of most other states as they have enjoyed an oil boom in recent years. Confidence in the economy varies significantly from state to state, though it generally tilted negative in 2014, as has been the case in recent years. Although the yearly average for the Economic Confidence Index was steady in 2014 compared with 2013, improvements seen in late December have carried over into the new year, suggesting the index could gain real ground in 2015. But increases in confidence aren't always felt evenly throughout the country. West Virginia has continually languished at the bottom of the list -- as it has on a variety of measures -- and many Southern states have too. Pockets of extreme discontent with the economy can hamper national progress, and state rankings such as this one provide an opportunity to see where improvement is most needed. Results for this Gallup poll are based on telephone interviews conducted Jan. 2-Dec. 30, 2014, on the Gallup U.S. Daily survey, with a random sample of 176,702 adults, aged 18 and older, living in all 50 U.S. states and the District of Columbia. For results based on the total sample of national adults, the margin of sampling error is ±1 percentage point at the 95% confidence level. Gallup's U.S. Economic Confidence Index averaged +3 for the month of January, up eight points from December. It is the first positive reading for an entire month since the recession. Explore New Data in "State of the States"
This month, Gallup is publishing new data and insights on the most important political, economic, religion and well-being topics at the state level.